This is a frame. Please click |About| below. I just like using that palindrome. So what’s on this page? It’s just a bunch of random electronic stuff, mostly my computers. I’ve realized in the past few months that I spend more time with computers than cars now that I’m in Europe. That’s pretty strange to me, but that’s how it is. With all of this interest, I thought it was odd that I didn’t have a website dedicated to this hobby. Afterall, who doesn’t have a website dedicated to the Operating/Computer System of their Faith? In other words, this page is just as useless as my other pages. So how many Macs have I bought, and why? I can list the Macs I’ve bought throughout the years, that’s no problem. But why I buy Macs instead of a Wintel? Good question. Why buy a Porsche instead of a Cavalier or a Corvette? I guess it’s a matter of taste. If you notice, I’ve also upgraded the processors a few times. That extends the life of the computer for me. If only I could upgrade car’s memory just as easily. Another thing I find funny is seeing how wimpy those specs are, even if you consider this is Apple hardware we’re talking about. Every look at the spec of your first x386 machine? And how much you paid for it? Pretty funny stuff, huh? My current workhorse is the iBook. I use this daily at work, even if we use NT (and soon XP). I can connect to my network easily, and inversely, connect back to my iBook. I can even check my Outlook mail and surf the web with the iBook. About the only thing I can’t do is check email with the Mail.app program, as our firewall won’t let me. 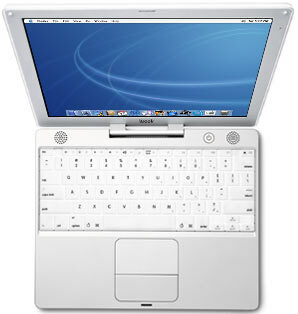 To be honest, the 12" Powerbook is the laptop I would rather have, but it wasn’t around when I bought the iBook. I have to the old ATI RagePro128 graphics card, or something like that, and that’s about the only downside to the iBook. It’s not because I play games (how much graphic horsepower does Spaceward Ho! need? ), but it would be nice if I could get the graphics from iTunes to display faster when I’m playing music. I also have a Windows computer, strangely enough. It’s beige, and I use it to work at home. That’s two good reasons to get rid of it right there— it’s Windows, and it’s for work. Still, it’s not that bad, for a Windows machine. It’s not as cool as my little brother’s setup with a plexiglass side and an internal neon light, but it gets the job done. Up to now, I haven’t installed Linux on any of my machines. Call it laziness, or incompetence. I’ve never used it, and I don’t know how it works. For the computing-savvy out there, I can’t change a camshaft either. Now you have another reason to laugh at me. The biggest reason for me to get Linux running somewhere is to check out this website on its browsers, and to check out differences between Linux and Mac OS X. When I get the time, motivation and a clue, I’ll check this out. 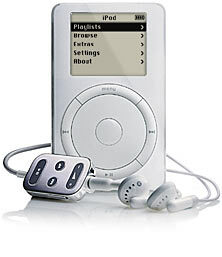 Have you played with an iPod, Apple’s mp3 player? They rock (or r0xx0r or whatever l337 people say), if you pardon the pun. I bought the 20 GB version this year. Last I checked it had 2377 songs, with 7.3 GB left over. According to iTunes, this is roughly 6.2 days of music. That’s not really so much, but it’s still cool. The best part is how quick Firewire is when synchronizing this to my iBook. All of these songs needed only a few minutes to transfer to the iPod. The Firewire port is also where it gets its power. Navigating through it’s menu is a piece of cake—I wish other menus were this simple and useful. Actually, there are a few other cool things about the iPod. It has a solid state scroll wheel, for example. This scroll wheel doesn’t move—it’s more like a track pad of a laptop. Additionally, you can store addresses and calendar info that you can easily view. I didn’t think I would ever use this feature, but now that I have, I’m glad it’s there. It can be pretty handy, since I take the iPod almost everywhere. Oh—and I hear it plays music. I’m including my Nikon Coolscan 4000 here, only because I’ve never had a film scanner before.